Commercial Land for Sale in Delaware Basin Area of Pecos, Texas. The First Keystone Pecos Industrial Park in Pecos at the heart of the Delaware Basin Region of Texas, is a 75-acre master-planned development located at the center of the fastest growing energy center in America. Those looking for commercial land for sale in Texas should carefully review the opportunity in Reeves County, the heart of the Delaware Basin. First Keystone aims to provide its clients with a perfect point of presence. First Keystone's new Delaware Basin facility is the first full-service industrial park to serve this growing region and to offer top-quality commercial land for sale (or lease) in Reeves County. Located conveniently within Pecos City, we offer a variety of ready-to-go solutions for offices, shops and warehouses. Our industrial park has all the critical infrastructure requirements that any client looking for commercial land for sale in Pecos could possibly ask for. We are rail-served, too, so the need for shipping materials in or out of your facility has already been accounted for. We have ready-to-go buildings from Fehrs -- including reserved slots in the future. Thus, our customers in the immediate Delaware Basin counties can achieve quicker deliveries because of our positioning. This includes your own design of a footprint that’s the right fit for commercial land for sale in Reeves/Pecos. Fehrs is the leading supplier of industrial/shop/office buildings in the Delaware Basin and our partnership has made the amenities provided below possible. In this ultra-tight market, our preferred position with Fehrs can provide you with an important advantage. This means a streamlined site-planning process as well as ready-to-occupy buildings. Brokers protected. Pecos is the only established town within the core of the Delaware Basin. 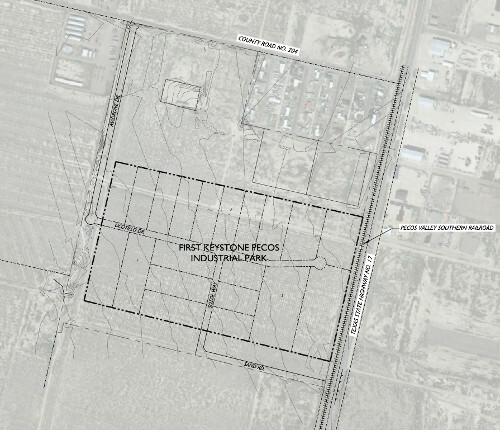 First Keystone is dedicated to delivering a "Class A" experience to those seeking to buy or lease land and commercial buildings in the greater Pecos area. When you choose to position your business within one of the dynamic Delaware Basin counties (especially Reeves, Ward, Pecos and Culbertson), we aim to make that decision pay off immediately! That’s due, in part, to the commitment to open up a complete industrial park with instant occupancy. For a tour of First Keystone Pecos Industrial Park, contact us today. Planner of the Delaware Basin's most dynamic industrial park and logistic hub, First Keystone supplies all sectors of the energy industry.